From Christmas to Skiing to Scotland, it has been 3 months of eating a ridiculous amount and drinking endless mulled wine. With the spring and summer months creeping up on us, it is time to get back into shape and start eating healthy again (with the occasional treat, obviously, I am a baker after all!). My problem is that I have a serious sweet tooth and after dinner I neeeeeeed something to satisfy my ‘want to eat everything naughty’ cravings. 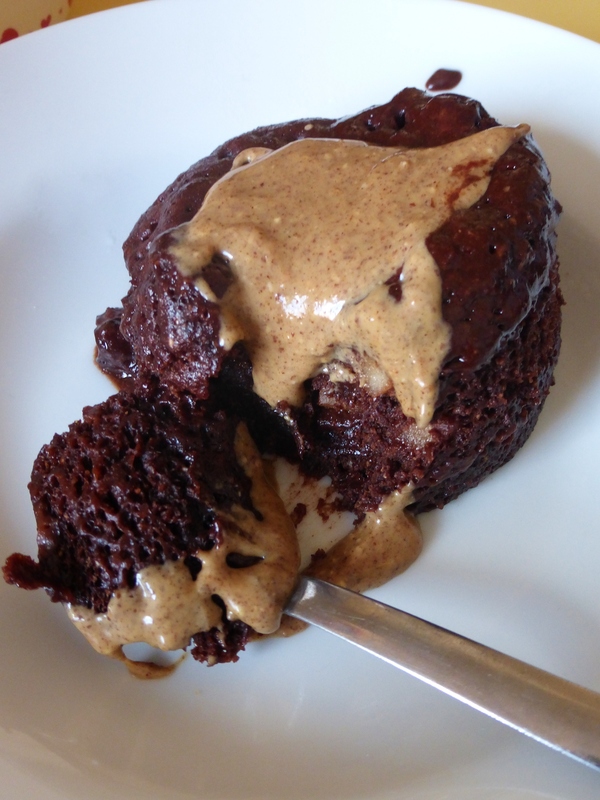 So I have recently been experimenting with some healthy desserts and have come up with this… A rich chocolate fondant cake which is completely guilt free but tastes ever so good, and it only takes less than 5 minutes to make! In a small bowl, mix dry ingredients well. Now add the liquids and stir until all ingredients are completely combined. Transfer cake mix to a mug that has been sprayed with spray oil/cake release spray. Pop the mug in the microwave on full heat for approx. 1.20 minutes, keep checking to see if the cake is cooked on top. Remove from the microwave and leave to cool for 5 minutes before turning upside down onto a plate. Serve on it’s own or with Greek yoghurt, fresh fruits or peanut butter.